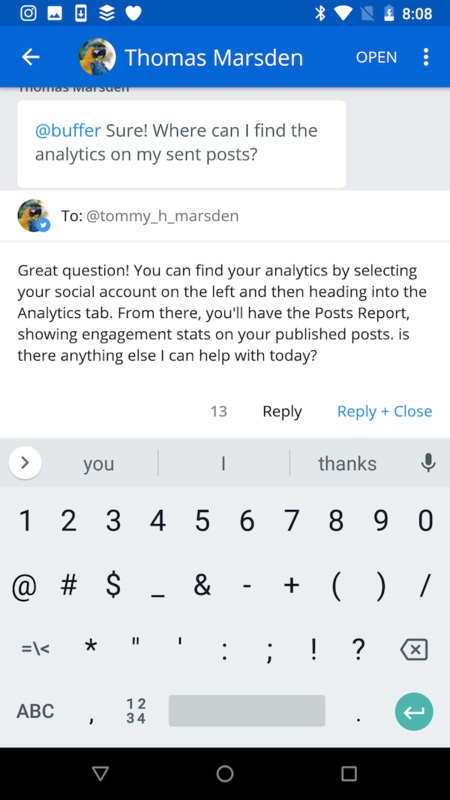 Reply is our engagement tool, which enables you and your team to respond to social conversations within one simple inbox. 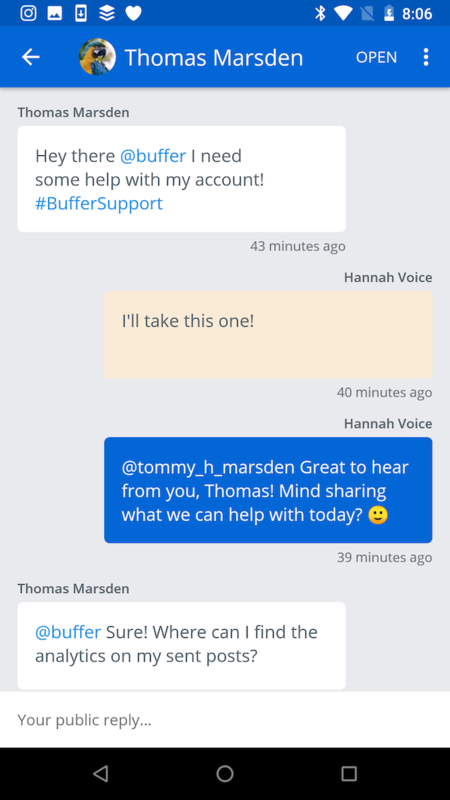 Instead of hopping between social channels, your team can jump into Reply and tackle everything in one place. 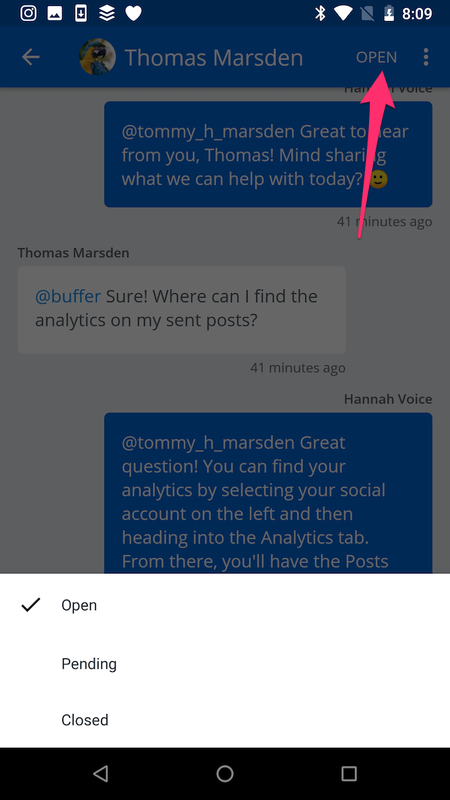 Reply is also available on Android, allowing you to respond to all your social messages on-the-go! Grab the Reply app from the Play Store here. Team Inbox Unassigned conversations that are set to Open or Pending. Mine Conversations that are assigned to you that are set to Open or Pending. Assigned Conversations that are assigned to other team members that are set to Open or Pending. Closed Conversations that are set to Closed. Spam Conversations from contacts that you have muted, along with conversations that have been routed here as a result of an Automation Rule. Learn more about Automation Rules here. Custom folders These are your tags, otherwise known as custom folders. Learn more about the uses of tags and custom folders here. 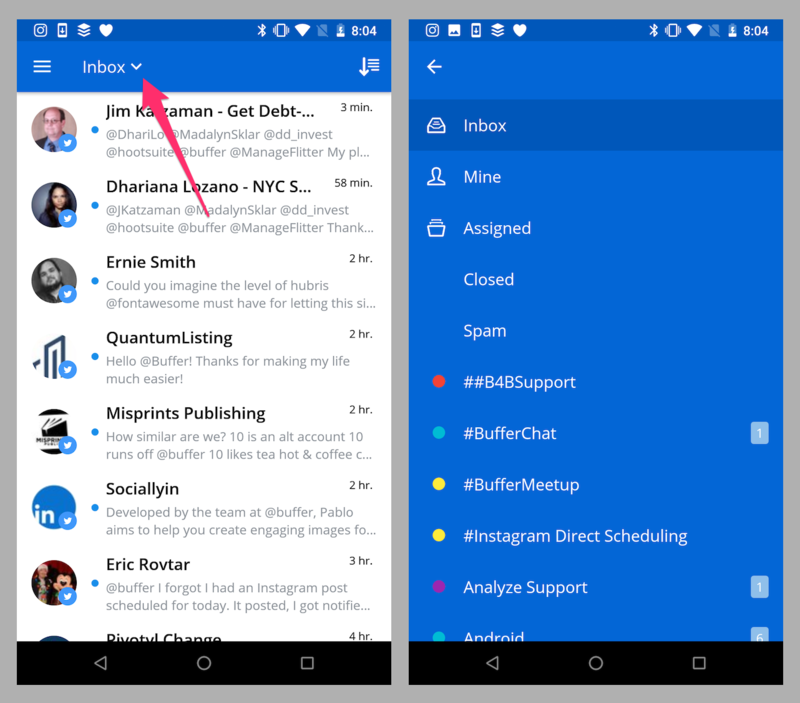 You'll see a preview list of conversations in the Team Inbox and other folders. 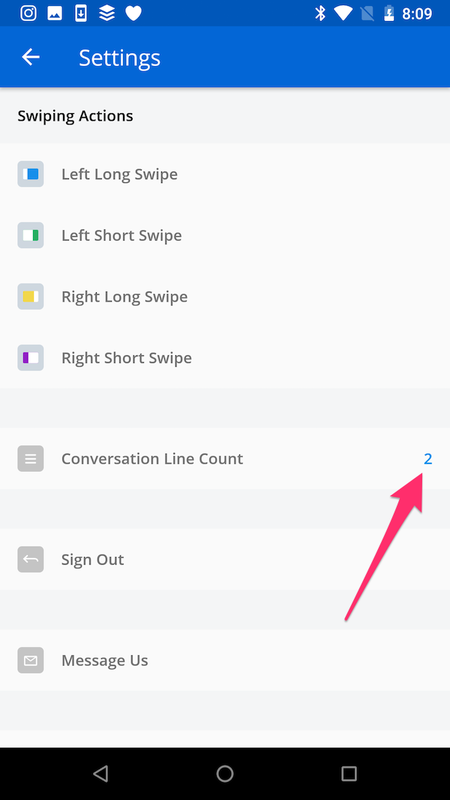 The number of lines you see per conversation can be customized in the Settings area. 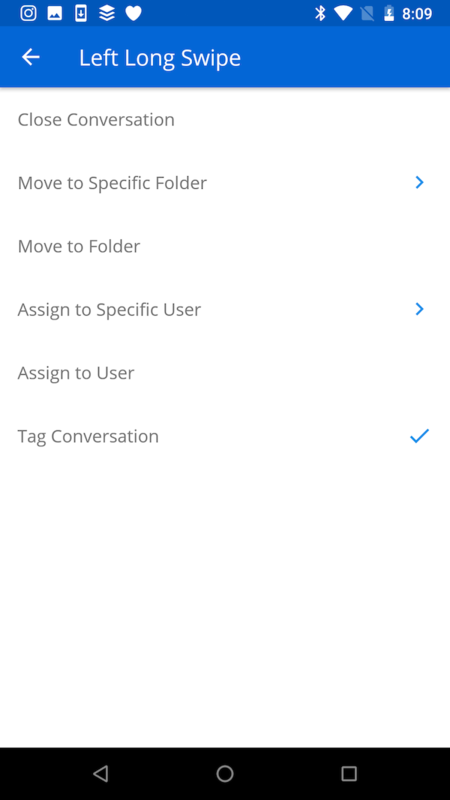 When previewing conversations in the Team Inbox or another folder, you can swipe left or right to enable various actions such as tagging, moving, and assigning. Swipe actions can be customized in the Settings area. Please note, it's not currently possible to tag, move, or assign a conversation when viewing the conversation itself. This can only be done from the preview list of conversations. Tap on a conversation to view it. Here, you'll see all threads between the user and your team. 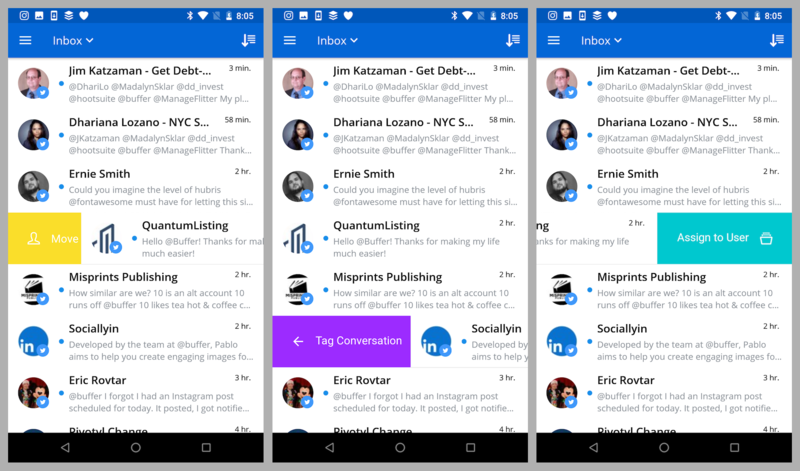 Messages from users will be shown in white and displayed on the left hand side, while replies from your team will be shown in blue and displayed in the right hand side. Internal notes added by team members will be shown in yellow, also on the right hand side. Tap inside the composer at the bottom of your screen and then type in your reply. When you're ready to send it, tap Reply (send your reply and don't change the status) or Reply + Close (send your reply and change the status to Closed). You can change the status of a conversation by tapping the current status at the top right of your screen and then tapping Open, Pending, or Closed. Various settings can be customized by tapping the Reply icon at the top left of your screen and then tapping Settings. Close Conversation After swiping, the status of the conversation will immediately be set to Closed. Move Conversation After swiping, you'll be able to tap on the folder you'd like to move the conversation to. Move Conversation to Specific Folder If you often move conversations to a specific folder, and you don't wish to see a list of folders each time you swipe, this option can be handy. After selecting this option in settings, you can then choose the specific folder you'd like to move conversations to every time you use this swipe action. 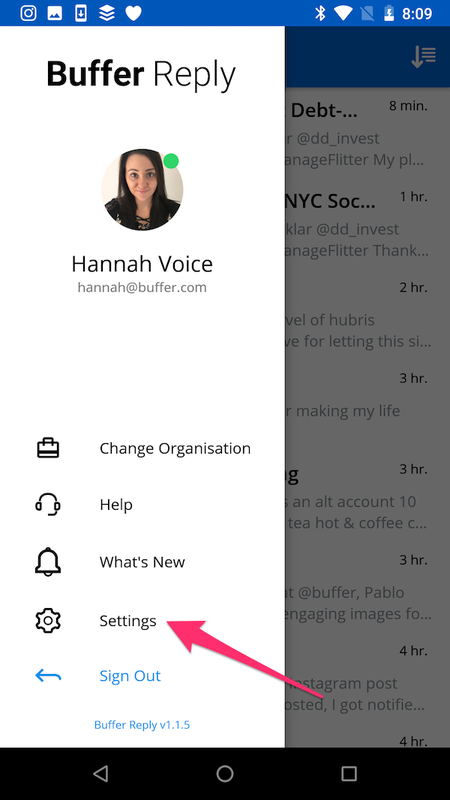 Assign to User After swiping, you'll be able to tap on the team member you'd like to assign the conversation to. Assign to Specific User If you often assign conversations to a specific team member, and you don't wish to see a list of team members each time you swipe, this option can be handy. After selecting this option in settings, you can then choose the specific team member you'd like to assign conversations to every time you use this swipe action. Tag Conversation After swiping, you'll be able to tap on the tag you'd like to apply to the conversation. 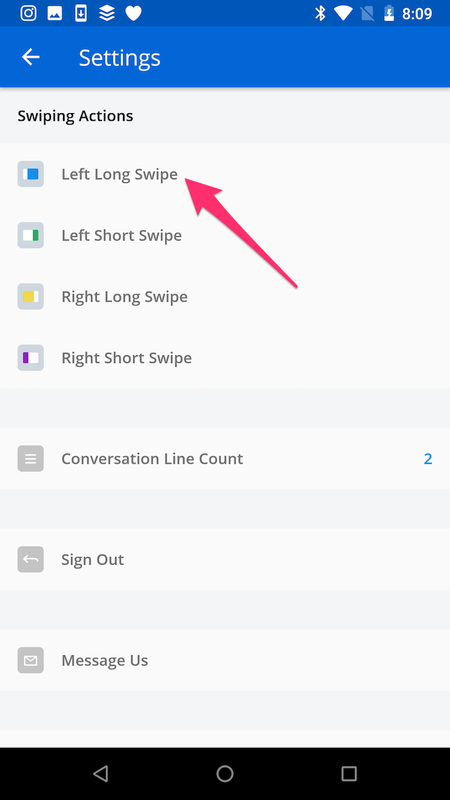 To change these settings, tap the type of swipe you'd like to change under "Swiping Actions". Tap the action you'd like to enable for the chosen swipe. You can then return to the previous screen using the arrow icon at the top left and change the other swipe actions if you'd like to. Swipe actions are set on a per-user basis. Changing your settings here will not affect other users' swipe actions. Choose how many lines of the conversation are shown in the preview by tapping Conversation Line Count and then choosing between 1 and 5. The Reply mobile app doesn't have all the features available within the web app, but we're adding more features all the time! The table below outlines which features are currently supported.